Mayans had a fairly advanced written language which helped them pen down a large body of literature. Mayans inscribed their writing on stelas, in books called codices and on monumental architectures. The language comprised of a huge body of glyphs and was called hieroglyphics by the early Europeans who discovered it. The glyphs of the Mayan language comprise of both logograms and syllabic glyphs. So the language allowed Mayans to communicate using phonetic phrases as well as symbolic terms. Mayan script is the only Mesoamerican script that has been deciphered and understood for the most part as a result of modern scholarship and research. Although it is not known exactly when the Mayans develop their specific hieroglyphic script, the earliest historical records of the written Mayan language date back to 250 B.C. The dates of some recent Mayan sources have been traced to 300 B.C. but these claims remain to be confirmed. Researchers estimate that the Mayan alphabets, or glyphs, were developed much earlier than this date. From 250 B.C. onwards, evidence of the use of Mayan alphabets has been found in the historical evidence gathered from a number of extant Mayan sites. Mayan alphabets are called glyphs. They are so called because they comprise of an image, or a set of images, to represent any phrase. Mayan alphabets are called glyphs. They are so called because they comprise of an image, or a set of images, to represent any phrase. The images are typically of two kinds. One type is the logogram, which refers to such an image that can represent an entire word. Another type is called the syllabogram which represents a single syllable, rather than a word. Mayan alphabets are a combination of these two. The Mayan script includes nearly 550 logograms and 150 syllabograms. Another 100 Mayan alphabets were used to denote the names of places and gods, denoting proper nouns. At any given time, the Mayan language didn’t make use of more than 600 glyphs, although the total variety of the glyphs reaches as high as 800. Modern scholarship has been able to access a vast body of Mayan language, and different combinations of Mayan alphabets, thanks to many extant Mayan sources. One of the primary, and earliest, sources of the Mayan alphabet are the archaeological sites of ancient Mayan cities. Some of the sites have stelas and reliefs carved into the architectural facades, comprising of the Mayan glyphs. Other sources include inscriptions on extant Mayan ceramics. The largest source of Mayan alphabets are the extant Mayan books called codices. Although the Spaniards destroyed most of the Mayan books when they invaded Mayan lands, some of them survived and exist to this day. It is using these books that modern researchers have been able to decipher the Mayan alphabet. The Mayan alphabet is the only kind of Mesoamerican script that has been successfully deciphered. Attempts to understand the Mayan alphabet can be dated as far back as the 16th century when a Spanish bishop accompanying the conquistadors penned down a key for the Mayan syllables. He attempted to compile the key in alphabetic fashion and although his attempts were futile, the key became a valuable source for subsequent attempts to decipherment. It was in the second half of the 20th century that researchers developed theories regarding phonetic representations among the Mayan alphabets. It was based on these theories that the extant Mayan literature was reviewed once again and successfully deciphered. Mayans made use of their alphabet in a specific fashion, so that Mayan writings are done in a certain structure. Typically, Mayan inscriptions are vertical compilations of different alphabets. A single vertical compilation comprises of 6 alphabets, with three each in two columns. The order of reading them is such as the first the top-left alphabet is read, next the alphabet to its right, then the left alphabet of the second row followed by the right alphabet in the row, and similarly with the last row. If another phrase had to be added, it was added to the right of this compilation. Mayan alphabets were primarily of two types, logograms and syllabograms. The logograms denoted an entire word or phrase with a single image or symbol. They were a sort of shorthand, a more comprehensive way of writing something. Syllabograms, on the other hand, made use of individual syllables which were then paired together to represent an entire word. Mayans often used a combination of both when penning down an inscription. This made the Mayan language a very flexible tool of communication, making it possible for Mayans to convey things with clarity and detail. Typically, the use of the Mayan alphabet and its knowledge was limited to the Mayan priests. Priests were the ones who learnt the language as part of their job and guarded its knowledge. They taught it to the children of royalty and the nobility. The task of writing books, however, was specifically limited to the priests who usually wrote books on topics related to religion, astronomy and history. The use of Mayan alphabets in most Mayan cities was often political. The rulers would erect stelas with Mayan alphabets to make different announcements as well as to proclaim their authority. Sometimes, such stelas were publicly displayed at the ascension of a new Mayan ruler. Mayan alphabets are different images or symbols which make up the Mayan written language. These symbols are called glyphs and there are two main types of them, namely logograms and syllabograms. Such Mayan alphabets which are logograms typically represent an entire word or phrase with the help of a single image. Syllabograms, on the other hand, represent every word or phrase by conjoining multiple syllables. 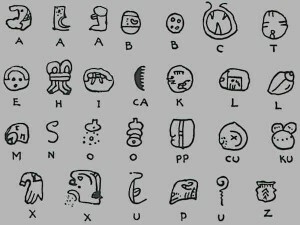 The total range of the Mayan alphabets include a large number of both of these types of alphabets. Mayans used these alphabets to pen down a large body of literature, most of it included in Mayan books called codices. Other extant Mayan sources with inscriptions using Mayan alphabets are Mayan ceramics, stelas and monumental architecture in the ruins of Mayan cities.